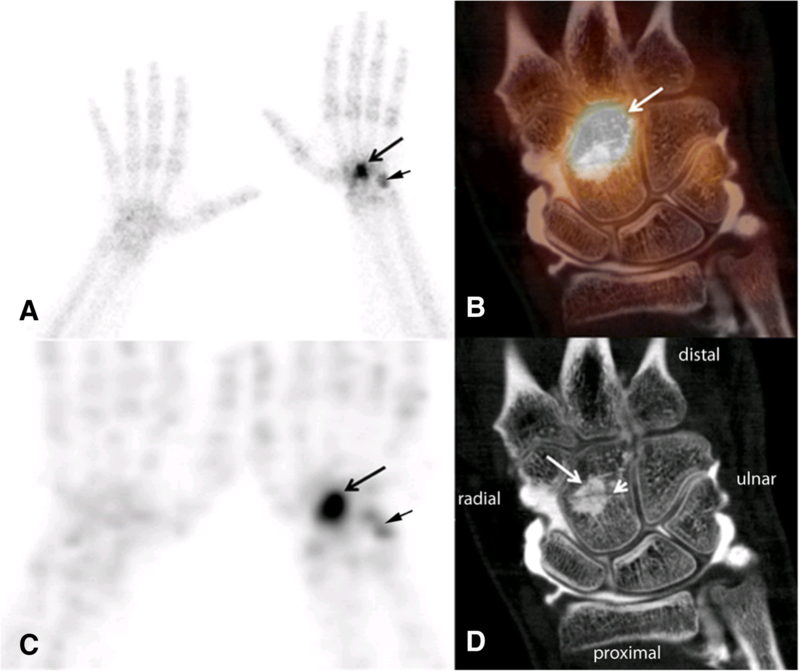 Single photon emission tomography/computed tomography (SPECT/CT) combines the strengths of bone scintigraphy and CT and serve as an important alternative to magnetic resonance (MR) imaging in carpal trauma patients if conventional x-rays are equivocal. In a young patient with pain 4 days after carpal trauma conventional x-rays were negative for fracture and MR showed only bone bruise. SPECT/CT arthrography one month later revealed intensive uptake in the capitate bone corresponding to a fracture through a bone island on the CT part of the study. SPECT/CT combines the sensitivity of bone scintigraphy and specificity of (diagnostic) CT and might serve as an important second line imaging modality for the detection of occult carpal fracture. Fractures of the carpals are very rare and sometimes difficult to detect with conventional x-rays. CT and bone scintigraphy are superior to conventional x-rays in the detection of carpal fractures (Akdemir et al., 2004; Welling et al., 2008). Since SPECT/CT is available it has been successfully used for imaging of patients with unclear carpal and wrist pain (Huellner et al., 2012). We report a case of a 27-year old male patient with carpal pain 4 days after falling from a ladder. Conventional radiographs were negative for fracture. MR (Fig. 1) showed some bone bruise (A,B short arrows) and a bone island (A,B, long arrow) and the patient was referred for SPECT/CT arthrography. SPECT/CT arthrography (Fig. 2) was performed one month later with the technique described before (Bhure et al., 2017). Planar bone scintigraphy (A) and SPECT (C) images showed intensive focal uptake in the capitate bone (long arrows) corresponding to a transverse fracture on CT (D, short arrow). Incidentally the fracture went through a homogeneously dense lesion with distinctive radiating bony streaks (known as “thorny radiations”), typical for a bone island or enostosis (D, long arrow). 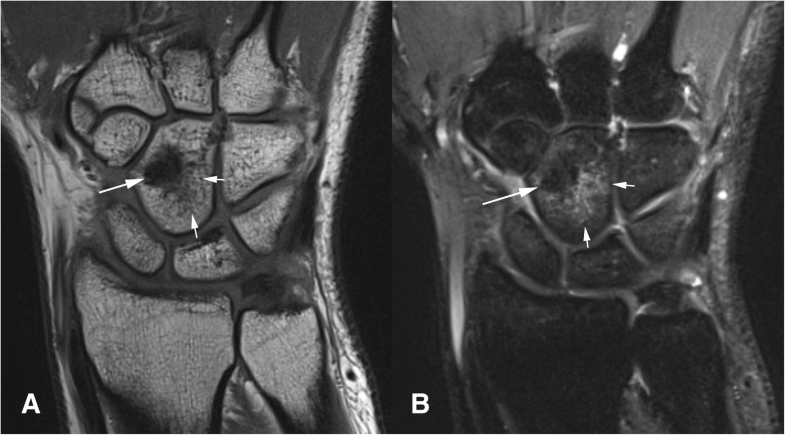 Triangular fibrocartilage complex (TFCC), scapholunar (SL) and lunotriquetral (LT) ligaments were intact. The patient was treated with a splint. CT follow-up after 3 months showed successful fracture healing. Carpal fractures besides scaphoid fractures are very rare (approx. 1% of all fractures) and often difficult to diagnose with conventional imaging. De Zwart et al. compared SPECT/CT to planar bone scintigraphy in ten patients with carpal trauma and found more accurate anatomic description of fractures with SPECT/CT in three patients (de Zwart et al., 2015). Allainmat et al. confirmed the superiority of SPECT/CT in the detection of posttraumatic bone lesions after carpal injury (Allainmat et al., 2013). The additional use of intraarticular contrast, known as SPECT/CT arthrography, enables the evaluation of important structures like TFCC, LT ligament and SL ligament as well as the cartilage (Bhure et al., 2017). Since wrist and carpal fractures are often associated with ligament tears the combination of SPECT and CT arthrography in one imaging application allows the detection of these therapeutically relevant additional injuries (Klempka et al., 2016; Lee et al., 2013). Because arthrography is a minimally invasive procedure with very low risk of complications, such as infection, it should be applied selectively if ligament or cartilage injuries are clinically suspected. Typical appearance of fractures in MR are hypointense lines surrounded by bone marrow edema (Shepard et al., 2014). Querellou et al. compared SPECT/CT and MR in 52 patients and confirmed the good performance of SPECT/CT in carpal fractures (Querellou et al., 2014). They described in 6 cases fractures in SPECT/CT where corresponding MR showed only bone bruise. A capitate fracture did not occur in their series. In this presented case the fracture coincides incidentally with a bone island. Bone islands (enostosis) are benign congenital or developmental bone alterations representing compact bone within cancellous bone (Greenspan, 1995). They are typically asymptomatic incidental findings on imaging. On CT bone islands appear as alterations denser than cortex and creating a brush-like border. Prevalent anatomical localizations are femurs, hands, humeri, pelvic girdle, and ribs. The majority (75%) of enostosis display normal uptake on planar bone scintigraphy, even if SPECT and SPECT/CT modalities have disclosed some “warm” enostosis which are inconspicuous on planar scintigraphy (Achong, 2007). Some bone islands are “hot” on bone scan and should not be misdiagnosed as malignant lesions (Greenspan et al., 1991). SPECT/CT combines the sensitivity of bone scintigraphy and specificity of diagnostic CT and may serve as an important second line imaging modality for the detection of occult carpal fractures. Conception and design: KS, LA, FP, TvW. Acquisition of data, analysis and interpretation of data: KS, WvB, ER, FP, WUK, TK. Drafting the article and final approval of the revised manuscript: KS, LA, WvB, GG, WUK, TvW, ER, FP. All authors read and approved the final manuscript. For this case report, informed written consent for publication was obtained from the patient. None ethics approval was needed. The authors declare that they have no conflicts of interest or competing interests.